Do you need a heating repairman in Jonesboro? R Fulton Improvements specializes in heating system repairs for residential and commercial heating systems. Our technicians are fully insured and Georgia licensed to perform electrical and plumbing repairs, parts replacement, and system upgrades or conversions. R Fulton Improvements has been in business for more than 20 years. We have the expertise to handle any type of heating system repair. Call (678) 251-9181 to place your service call. We also offer 24/7 emergency service for clients throughout Clayton County, Georgia. Heating system repair, upgrades, and installation. If it's broken, we'll fix it. We've been in the HVAC business for more than 20 years, repairing heating systems in Jonesboro, GA. Call (678) 251-9181 to place your service call. If your hot water isn't working, call the hot water repair specialists at R Fulton Improvements for prompt service: (678) 251-9181. We come prepared to get you up and running as quickly as possible. Our service vans are fully stocked with all major brand parts and supplies. All Jonesboro hot water repair servicemen have state-of-the-art testing tools to help identify the source of the problem. From valve repair to plumbing leaks, we'll get your hot water running again. Call (678) 251-9181 for a free Jonesboro hot water repair estimate or Jonesboro hot water emergency repair. 5★★★★★ - "I called during the snow storm and they were extremely helpful. They couldn’t get to me due the weather but they walked me through what could be the cause of my lack of heat. I followed instructions and was able to reheat my home for my family. I will use this company for any needs that I have in the future. You cannot find a company where the people are genuinely concerned about the well being of their customers over profit! This tells me all I need to know about this company! I invest in rental properties and will definitely use them for any heating and cooling issues I have!" 5★★★★★ - "They were efficient and fast." 5★★★★★ - "I am very pleased with his work. He is very professional and experienced. He is prompt, overall I would recommend R Fulton to family and friends." 5★★★★★ - "Mr. Fulton should up early after calling and notifying me that he would... very clean cut man, kind , and respectful. He knows his stuff you can tell he defiantly has been doing this for a long time... found out our problem quick and had it fixed quicker.... I would highly recommend his service to anyone...."
5★★★★★ - "This project was installing a storm door. Roderick was prompt and professional and also explained if there were any setbacks on the job. His work was great! I will recommend to friends and neighbors." 5★★★★★ - "We were freezing and now we are toasty roasty, problem solved!" 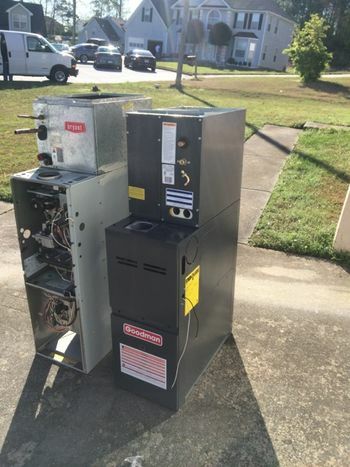 5★★★★★ - "I recently encountered a problem with one of my furnaces. The unit suddenly stopped working. A technician came out, performed diagnostic check on the unit, determined the problem promptly and now my system is working again. Thankful for the level of knowledge, skills, and expertise displayed. Will recommend to others and will use this company again!" 5★★★★★ - "One of the most professional customer service experiences I have been given. The staff answered my call and sent a tech out after business hours. The tech provided a diagnostic evaluation and gave me an appointment on a Sunday. They came at the time promised and completed the work in a timely fashion. Also, I had been given a quote from another company and this company significantly beat the previous company's quote for the exact job. These gentlemen at this company value your time and money. They have earned my trust and loyalty." 5★★★★★ - "My AC went out on a hot and humid Georgia afternoon. I was sick to my stomach thinking about how much this was going to cost. My last experience was Cool-Ray so I felt like a sitting duck at the mercy of a technician who would take me for everything he could get from me... This however was not the case at all with this guy. He instantly felt like a friend. He was crazy kind, incredibly knowledgeable and surprisingly fair. He had my vents blowing cool air in no time... Such a relief! I thank God for people like him and I would absolutely recommend him to anybody..."
5★★★★★ - "Very satisfied with the promptness, knowledge & experience with work needed, & the price. After recognizing the problem, job was completed the next day. Will gladly recommend them to friends & family." 5★★★★★ - "Hands down the best. Affordable. Trustworthy. And knowledgeable. I will continue to use them." 5★★★★★ - "There is no better company than this Honest,dependable, and fair pricing." 5★★★★★ - "R Fulton Improvements did a great job properly diagnosing my AC repairs. They did not over charge and was competitively priced. They also followed up to ensure everything was going well. I spoke with the owner and he went above and beyond to ensure I was a satisfied customer. I'm extremely satisfied and grateful to have chosen R Fulton Improvements for my AC repair. They were my second opinion and saved me a ton of money I really did not have! I recommend all other investors use them as a first choice because they will be mine the next time!" 5★★★★★ - "I am so grateful to have found R Fulton Improvements! The service that this company provides is exceptional! When my AC unit stopped doing its job, I contacted Roderick- after enduring the heat of my house-turned-sauna and he provided excellent customer service. He took the time to help me assess the problem over the phone: had me check my breakers, the outdoor unit, and the furnace-as part of his due diligence and I am so very appreciative. I did NOT know what he was talking about, but he handled my situation with compassion and urgency. Lanard, the technician who came out to my home, is knowledgeable and produces results-which is the only thing that matters when the AC goes out. He also took the time to answer all of my questions in detail and taught me about 3 amp fuses! They came to my rescue and I am now thrilled to enjoy the comfort of my home! I will refer everyone I know to R. Fulton Improvements. Call 'em up and you will do the same!" 5★★★★★ - "I called with on a Friday due to one of my AC's had gone out and he was able to come out in less than 3 hrs to rescue us. Fixed in less than an hour. Very customer service oriented and will keep on speed dial." 5★★★★★ - "our central air conditioning unit totally stopped working on a Friday afternoon. We had a home warranty for the unit and when we called the company they gave us a contractor 40 miles from our home. They said someone would call to schedule service within 24 hours of the next business day (Monday). After sweltering through the weekend with nothing but temporary fans to help keep us cool (they did not), on Monday morning we finally got in touch with the contractor who said they would not be able to provide a service call until late Wednesday afternoon. SO...……..unwilling to cope with inefficient home warranty and a disinterested contractor we contacted Roderick Fuller at 10:30 AM on Monday morning and he said he could come by about noon to asses our problem. He arrived about 11:30 with his team, and although we thought we would need a new unit, he was able to repair our problem in 20 minutes! The next time we need home services of any kind, you can be sure that the only person we will be calling to help us with ANY home problem will be Roderick Fuller and his totally professional team members. Thank you again, Mr. Fuller." 5★★★★★ - "Very professional and honest. I had a water leak and a back up in the line. They came out and cleared the problem right up." 5★★★★★ - "Exceptional service and a breath of fresh air! Great business of integrity who gets the job done!" 5★★★★★ - "Thank you for an awesome job!!! Also for being a man of your words." 5★★★★★ - "An amazing company ! Very professional and well educated hard working guys. They will beat any price and still deliver quality product. I would highly recommend them to all my friends and family"
5★★★★★ - "I had the central heat fail in my home over the new year holiday and found R. Fulton Improvements on line. Mr. Fulton was very gracious to offer to come out on New Year's Day to assess the issue. He was very thorough and up front about the issue and recommended what was best for the safety of my tenants. He then went the extra mile to speak with the home warranty company and provide expert advice which resulted in authorizing a new furnace. Mr. Fulton was very professional and completed the job on time as promised. I will definitely, without reservation, call this company again and refer them." 5★★★★★ - "Roderick and his brother Reggie were friendly, professional and knowledgeable of the problem we were having with our air conditioniong unit. They thoroughly explained what the the problem could be and our options of fixing the problem. My wife and I decided to have them install a new A/C unit. Problem solved, two thumbs up, I would highly recommend them for job well done." 5★★★★★ - "Mon, Nov 20, 2017 -- Last night we tried to turn the heat on for the first time this season, and nothing happened. I found R Fulton on Yelp this morning and gave them a call. Mr. Roderick Fulton answered the phone himself and his technician, Al, showed up promptly at the scheduled time of 11:00. At first Al thought the problem might be that inducer motor for the furnace needed replacing, but when he got up into the attic, he found that the motor had just gotten stuck and needed to be dislodged. He had the heat up and running in less than an hour! I am so appreciative of Al's honesty and professionalism. It reflects well on Mr. Fulton's company. (He easily could have told me that it was, in fact, a bad inducer motor or some other more costly problem). I am happy to leave R Fulton a well-deserved 5-star review. Thanks to you both!" 5★★★★★ - "Very fast ,excellent service; he was a blessing in disguise!!!!" 5★★★★★ - "Total professional Totally trustworthy"
5★★★★★ - "We knew our cost upfront before any work was done. They worked to stay in our budget." 5★★★★★ - "First, I must say this company is going places. They truly are out to help people and not to rob people. I called them on a Saturday and they showed up the next day after church. They came to seek and conquer. In addition, they supplied excellent customer service and great pricing. I will definitely use them again and tell others about them as well. Kudos to this company and may God continue to bless all of their efforts. 5★★★★★ - "Very good, knowledgeable, suggested creative solutions to help save me money. Prompt." 5★★★★★ - "Roderick was very pleasant. He did come when he said he would, and he also offered, if I need anything, or if the unit had any trouble to call him again. And he followed up to make sure everything was operating correctly." 5★★★★★ - "Very fast turn around. Professional and went to work right away." 5★★★★★ - "You know you are in hell when it gets hot in Georgia and your air conditioning decides to go on holiday. R-fulton-improvements to the rescue. Thanks to Charles and Roderick we cooled down quickly. They were professional, knew their stuff, and made sure nothing was left behind unlike other experiences I have had with other companies. Their service was exceptional and would recommend them in a heartbeat. Thank you so much!!" 5★★★★★ - "Outstanding work ethic, attention to detail, timely and thorough! Quality workmanship!" 5★★★★★ - "The team did an awesome job. They were very knowledgeable and professional. The price was fair and they explained everything they were doing. I will be using them for future repairs and installations! Highly recommended." 5★★★★★ - "A/C unit had a leak and larger company quoted an astronomical amount for repair. Called and received thorough information and unit was repaired same day for an affordable amount. Repair tech was professional and informative and on every step. Highly recommend due to affordable prices for same quality work." 5★★★★★ - "Available on a Sunday when everyone else was closed. Dependable, professional, very detailed, and affordable. Thanks R Fulton"
5 ★★★★★ - "What can I say....Mr. Fulton and his team of professionals made believers out of us. Having worked in the HVAC design industry for our entire careers, my wife and I had high expectations and were very specific about our requirements as to how this system was to be designed and perform. Some of our expectations included all hard ducted trunk lines with hard runouts (minimal flexible ductwork), high efficiency ac (16seer min. ), high efficiency gas furnace (96% min. ), whole house humidifier and a smart wi-fi thermostat. With all this in mind, we came very close to hiring a commercial a/c contractor for this job but decided to give R.Fulton a try. As complex as this project was, from day one we realized they were the most professional, knowledgeable and dedicated group of guys we could have ever hired for this project and I must say we are more than pleased. We have a residential system which rivals many commercial systems I have seen and it functions flawlessly and looks awesome! Oh, and did I also mention that their prices are very reasonable as well? Thanks so much guys and I will insist that anyone who asks me about an a/c system replacement contact R.Fulton first." 5 ★★★★★ - "Mr. Fulton was professional, detailed in expression, great listener, and ethical. The job performed was a install of a new air condition unit. The install was done in a timely fashion and his staff was stupendous. There is no greater service here in Georgia (Affordable pricing)." 5★★★★★ - "Very friendly, professional and performed a job well done." 5★★★★★ - "Great company! Will be hiring again for 2 more projects I need done. Very professional, honest and fair pricing!" 5★★★★★ - "Very professional and knowledgeable team. The work was done on time and as discussed." 5★★★★★ - "Was very patient, worked in a timely manner with a very good rate. Exceeded expectations." 5★★★★★ - "This company was very professional and prompt. The wrk was performed quite well." 5★★★★★ - "I needed some duck work repaired in my house that had become disconnected overtime. It was in a difficult location, but Mr. Fulton got to the work and got it done in a very professional manner. I was just as impressed with his business manner as I was his outstanding professional expertise. I will call on him again for sure!" 5★★★★★ - "I would highly recommend R. Fulton Improvements. The service they provided was top notch. After months of dealing with HVAC issues, Roderick and Reggie came in and diagnosed the problem, and installed a new compressor for my AC condenser. They were professional and friendly and answered all my questions, while suggesting improvements to avoid future problems. They even took the time to follow up on their work to ensure the HVAC system was performing optimally. I have no complaints with the service and will definitely use them again." 5★★★★★ - "I recently contacted R Fulton Improvements regarding my A/C unit. Mr. Fulton was very patient, very professional and provided excellent service. I will definitely use R Fulton Improvements for future hvac issues and I will refer him to family and friends. I am overly satisfied with the service I received." 5★★★★★ - "An overall excellent job." 5★★★★★ - "Outstanding work and very prompt."